I just read through Bill Cook's "Binocular Collimation" and "Binoculars: Fallacy and Fact". I enjoyed both. I appreciated the cut-to-the-chase style, and understood most of what was written, which says much about his writing. From a mostly rookie binocular aficionado's perspective, they are both very valuable books. Money well-spent. I knew I was going to like the book when in the first few pages he properly used the word "myriad". Why the improper use is a pet-peeve of mine, especially when I use commas like they are confetti, I can't explain. But...that is not the purpose of this thread, but it is a motivation. I want to cobble together a collimating bench as he described in the book. I am far from a professional, but can glue, screw, nail, and duct tape, nearly as well as Red Green. So, I think this is something I can accomplish. My dad retired less than a year ago, and has been building a "wood shop" with more tools than I ever would have ever dreamed of having the chance to lose as a kid. He would champ at the bit to help me with a project like this. Plus, in years past he was a tool and die make, and as meticulous as anyone I know. So, between the two of us and with Mr. Cook's book as a resource, I suspect we can come up with a pretty reliable composition. Here is the gist of the post/thread: I thought it would be helpful to me and maybe others to see benches that others on here have built. Nice pics and a bit of info could be hugely beneficial. I personally have never laid eyes on an MK5 or any other collimator in person. So, the more visual aids I can find the better. That would be my only real disappointment in Mr. Cook's book(s), in that the pics were a little less than necessary for me. Hello! Yes, I googled the fallacy and fact book, and Amazon popped up. The "buyers the bought this, also bought these" box included the "Understanding 3-axis Collimation" book. It's from my phone, so not sure if I did it correctly. Edited by Earthbound1, 20 March 2019 - 07:11 AM. The second book is available as a PDF for download. So I am in the process of finding the parts for a Mk5. I was able to obtain an 11 inch plano-convex lens from Europe. I have the pieces to make the scope with the prism. I just haven't built it yet. I think the most difficult part is finding a large plano-convex lens for cheap. I paid like a $100, and somebody actually ripped it out of it's mounting so it has 4 small fractures around the periphery. I assumed that this would be the most difficult as well. In the book he mentions finding a $60 lens. That would be nice. Where did you find the prism? I am surprised that there aren't more people that have put one of these together. Seems like a pretty valuable tool to me. I have built my own setup, but haven't bought the book yet. Shipping costs for the paperback are prohibitive and it does not seem to be available in ebook format. Finding a lens at a reasonable cost is really difficult. What is the focal length of yours? Bill Cook’s 2nd book, Understanding & Attaining 3-Axis Binocular Collimation is at Amazon.com and is NOT a free PDF, although he has given away smaller monographs. To duplicate a Mk5 collimator, you’ll need TWO f/8 convex-plano lenses—resulting in an overall f/4 focal length. Two 1/8-inch Fresnel lenses from China will cost $60, will do the job, and will allow the collimator to be HALF as long—f/2. Will the image quality be as good as the original Mk5? No. However, the process is not about QUALITY but POSITION of a couple to reticles. described all of what is needed. You will not find that on a short post on this website. Ok. I am pretty dense, so there is no getting around that. Might as well get it out there. I understood that the Fresnel lens replaced BOTH plano-convex lenses. The author said, "...will replace both glass lenses with one...". So, is only one Fresnel needed? I found Fresnel lenses of sufficient diameter, but they're thinner than the 1/8" that is mentioned in the book. Probably obvious to folks here, but I am trying to comprehend whether the thickness, in this application, matters one way or the other. I have read the "Binocular Collimation" book, and went through it again. As I said, I really enjoyed both books, but the second one has much of the same info as the first. While they were very enlightening for a novice like me, they did not elaborate on some of the things that are slipping by me. Which is why I was hoping more folks has constructed one of these. I thought I had graduated to only need books with pictures, but maybe I STILL need pop-up books. I found an archived thread where a class on collimation was advertised. Googled for images of the Mark V, and searched YouTube for videos. I am coming up dry. I am not quite connecting a few of the dots on assembly. To be honest I believe you should first concentrate on building the „periscoped“ auxiliary telescope and jig to hold everything as that is actually the secrete sauce. If you have those then you can also just use a distant light source such as a very bright star (Sirus or Lyra) to collimate. Cory at Suddarth Optical maekes these from time to time. He might have a couple on hand. I’m going to see if I can use cheap rifle scope and a prism I got off ebay. Edited by SandyHouTex, 22 March 2019 - 09:34 AM. I have Bill’s book and I don’t recall needing TWO lenses. Where is that? I don't think an f/2 or f/4 lens will do the job due to spherical aberration as a simple ray tracing confirms. A longer f-ratio is more convenient. Not to be too inquisitive, but have you built something like this? It would be awesome to see a photo, if you have. Maybe I am misunderstanding something, but on page 46, there is a diagram that shows item "B" as being "...2 thin convex-plano (plate glass) lenses." There is at least one other reference on page 55. There he says, "But remember, as Fig 15.1 illustrates, it's two lenses made of relatively thin convex-plano soda-lime plate glass." If you and I are talking about two different things, I apologize. On this point, though, does the thickness of the Fresnel lens make a difference? Could a lens that is thinner than the 1/8" lens to which the author refers be used effectively? If the answer should be clear to me, I apologize. Edited by shredder1656, 23 March 2019 - 06:09 AM. I see that. I’m not sure why there would be two. Chromatic abberation won’t be controlled at all with two plate glass lenses. My plan is to use one f/4 plano-convex lens and a green filter, if necessary, to control chromatic effects. Don't bother with the thickness of the lens, it won't make much of a difference. But, be careful with the f-ratio of the system you are designing. You are willing to collimate to a certain precision, let's say 30 arcmin at the eye. This translates into 3 arcmin at the objective. 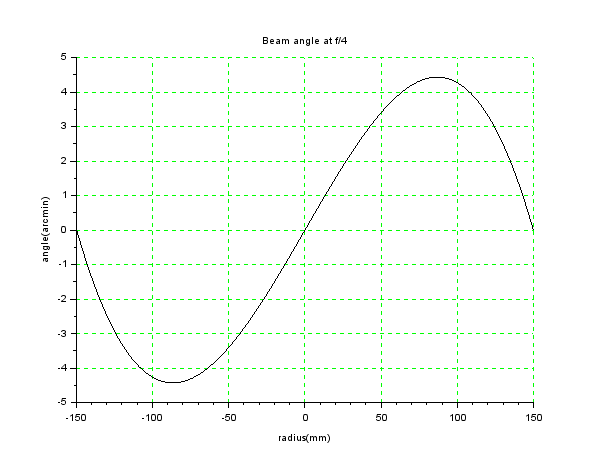 A f/4 collimator will have rays not completely parallel due to spherical aberration, and the error is more than 4 arcmin (look below the graph of angle error vs ray position for a 300mm aperture f/4 collimator). So you need a longer f-ratio lens. Edited by Ant1, 23 March 2019 - 12:35 PM. According to Bill, 2 lenses are not needed where noted, he simply purchased 2 lenses, when he bought them. So lets put that to rest, he wants that cleared up. Thank you for clarifying that. Sorry for the confusion. The way I understand it, there is an illuminated target at one end of the collimator. It is at the focus of the large plano-convex lens. When viewed from the opposite end of the target, where the binoculars to be collimated are held in the fixture, it just provides a target at infinity. e.g. parrallel light rays. Unfortunately not. I have researched it considerably and understand the working principles. I am currently not collecting as many classic binoculars as I have in the past so I simply don't have much use for the collimator at the moment. I do have most of the pieces I need together to make the auxiliary telescope which I will probably just simply use on a distant light source as I have clear sight to lights that are about 1km away. It's a project waiting for the need at the moment. Edited by Mad Matt, 25 March 2019 - 02:03 AM. Yes, that should make a perfect collimator. Page 58 of the Binocular collimation book reveals that Cory Suddarth himself uses a C-8 when he is on the road and a C-14 in his shop. As mentioned, the collimator is not the secret sauce... its the Partially Periscoped Auxiliary Telescope (PPAT... yes, I just made that up, thank you ) and the jig to hold it all that is what makes it work. Edited by Mad Matt, 25 March 2019 - 08:36 AM.